From August 1 get ready to enjoy cheaper Broadband services from BSNL provided you are a Prepaid Broadband customer of BSNL. Alongwith this BSNL will also offer its subscribers an option to buy the modem or get in on rental basis, which was not available earlier for its Prepaid subscribers. * The revision in Rs. 1000/- & Rs. 1400/- volume based recharge voucher and New volume based recharge voucher of Rs. 6000/- is launched as a promotional measure for 90 days. ** Validity and Top Up vouchers shall not be applicable to those using unlimited usage vouchers. *** Existing Rs. 300/- validity voucher lying in stock may be used in lieu of new validity of Rs. 100/- by revising its MRP. 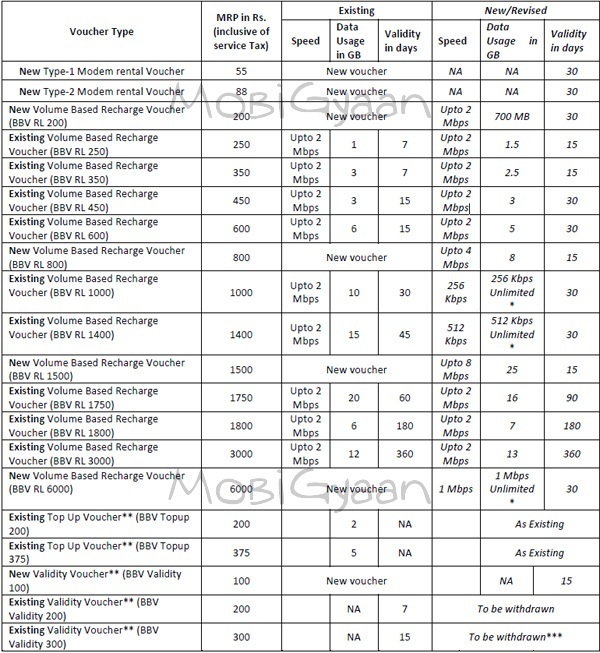 The Grace Period-2 (GP-2) for all the new/existing recharge vouchers shall be 30 days instead of existing 45 days.